Over the past few months, I’ve snapped new products I am testing out and trying and I’ve received SO many questions regarding my thoughts on these products. However, I thought it would be fun to share with you my holy grail drug store (or affordable) makeup as well as my HG (holy grail) luxury/high end items! -This is comparable to St. Tropez or any other higher end self tanner. In fact, I’ve told so many friends and family about this product and they all tell me it’s better than a spray tan. -If you’ve followed for me for a a while you know I am a huge fan of this sponge. I believe a sponge is essential for makeup application so I like to have a few back ups in my vanity drawer. I do like the Beauty Blender a lot but I think this is equal to the BB and it’s half of the cost. -I own like every highlighter that comes out – mainly because not many work on my skin or show up on my skin. I am always trying new ones hoping they will really show up and make my skin glow! The other day, I got a package from ColourPop and randomly tried their highlighter and I was in shock. They are GOOD. Holy cow – you guys have to try it! I keep this in my handbag because it’s a favorite of mine. I have HG mascaras that cost $25+ but I like using this one for layering mascara. If I want my lashes to look extra long I add a coat of this one! Just a warning – this is a strong product BUT it is SO waterproof that I find it 100% worth it. It’s not super user friendly but boy, when you get used to it – it stays and your eyebrows will not move all day! This brush is $25 which is not cheap, but its kind of a dupe for the Nars brushes that are $50+. I think these brushes are really good quality and many of them are similar to the Nars brushes. This liner is everything. I use it almost daily – its the best liner because it lasts and the color goes with SO many lipsticks. I also think it helps make your lips look fuller because the shade is a brown color that creates a shadow effect! Oh- em- gee! I love this line SO much. They sent all of the colors in a PR package and it was SO fun. This formula is amazing – super smooth, pigmented, and wears SO well! I seriously LOVE this powder. It is pricy but it is worth it – if you need it. I think it is best for those who need full coverage or are oily. This powder can be worn alone for coverage but I use it over a lightweight foundation. It lasts ALL day and is REALLY good. I keep it in my handbag throughout the day. I don’t know of any powder foundation that even compares to this. Ahhh I spent weeks trying to hunt down this concealer – it is always sold out. 🙁 I found a ‘fair’ shade and purchased it but the color didn’t match. BUT the formula is so good. It’s full coverage and just wears so well and covers my dark circles. This comes as a set but I think it’s a good deal to buy both. I buy a new Sigma F80 every 6mos or so because I only use this brush for foundation application. It is the only brush I really love for a flawless application. The cleaning mat is essential – I clean my brushes before I go on a trip which is about 2-3x a month. The mat does all of the work for you and gets all of the product out easily. Could you do a review of how your skin is now that you have finished Accutane? I am going to be starting next month and am wondering how my skin will be after not being on it for a year. Has your skin gone back to how it was? I'm going to have to try that self tanner! Falsies has also been my favorite drug store mascara, my lashes look so full and long every time I wear it. I'm going to have to try the self tanner. What is your favorite shade of the colourpop highlighter?? I love the Real Techniques beauty sponges! Nice post 🙂 Thanks dear! 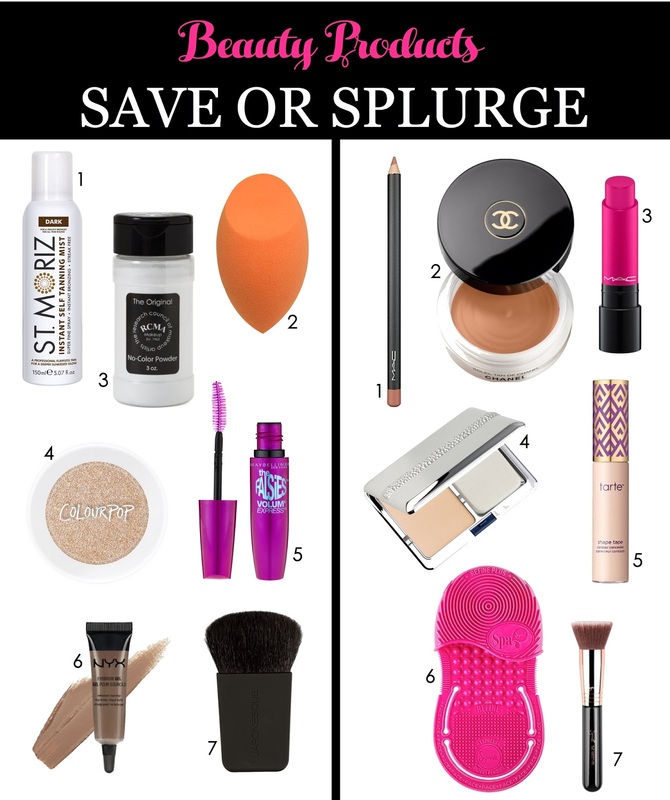 I love a good save vs splurge when it comes to all things beauty hair and fashion! Sometimes its WAY worth it to splurge and other times the cheaper version is just as good! I think I'll try the "save" beauty blender next since Ive been wanting a separate one for my highlight! Thanks girl! Great picks! I always love splurging on foundation (Giorgio Armani Luminous Silk for the win!) but I'm a sucker for a cheap, bright lipstick! The Maybelline Falsies mascara is one of my faves from the drugstore! Love this post- I'm definitely going to try the self tanner and sponge! These are all great recommendations! I am in love with the NYX eyebrow gel! I am going to have to try that Colourpop highlighter. I had no idea they had highlighters. The Real Techniques sponge is definitely a good dupe for the Beauty Blender. Great post! Great post on make up. There are so many amazing products out there that you don't have to spend a lot on. Thanks for the saving section it totally helps. I really want to try the shape tape concealer! Every time I have looked, it has been sold out too! Hopefully will get my hands on it eventually! I was so curious to read your thoughts on the Chanel BRONZER because I heard many great things about it. I had to have it. I agree, it smells nice, it’s so creamy, but I was totally disappointed that there is only One shade and it is too light for me as well. I’m not even that tan, giiiirl. Hoping and praying FOR more shades.